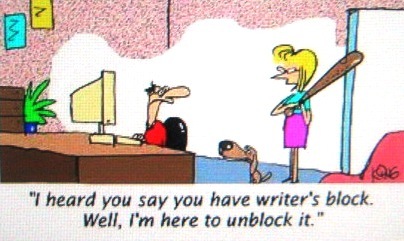 The Happy Whisk: Have Writer's Block? No writer's block for me. Story's itching to be written. Sitting down to do it is the difficult part. I like it unlike the colon block working with Ray causes me! Stacy: Good thing too, those bats really hurt. Lurker: lololol. Nooooo. I don't believe you. Ray is Mister Sunshine. Who doesn't love sunshine. Anita: Harder to get you if you're hiding in a closet. Bartender: Today's Special is free. Nothing like a good knock in the head to really unblock a writer. She's taking a page out of the Al Capone book of setting things right, is she? mshatch: Never saw that one. William: Well, I don't believe in writer's block, so I figure a good whack to the head should do it.